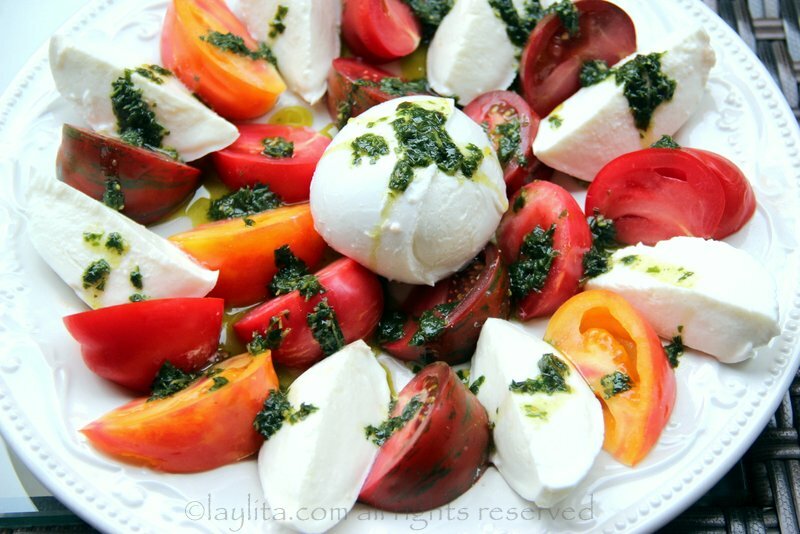 Caprese salad, or insalata caprese, is a classic Italian appetizer or salad; it is made with fresh mozzarella, ripe tomatoes, basil leaves, and usually drizzled with olive oil and balsamic vinegar. 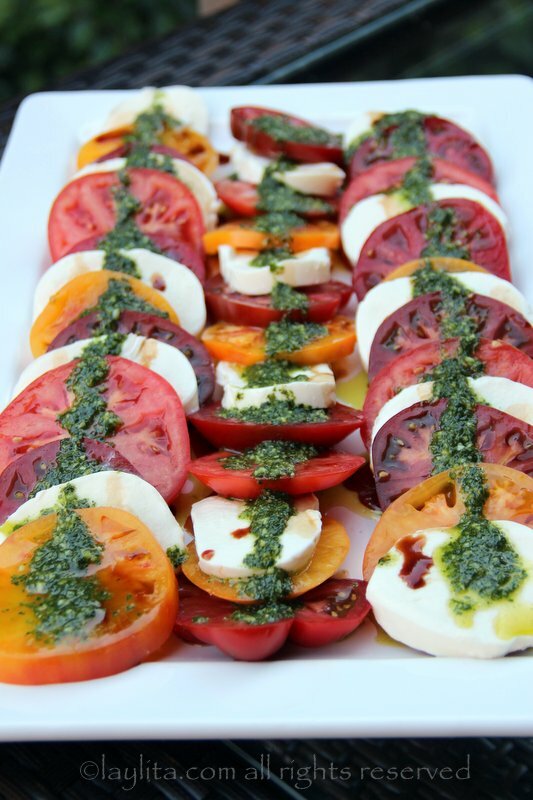 There are many different variations of this traditional dish: I’ve had it served as a salad with greens or arugula, with capers, with onions, and there are modern caprese variations that replace the tomatoes with avocado, peaches, strawberries, etc. 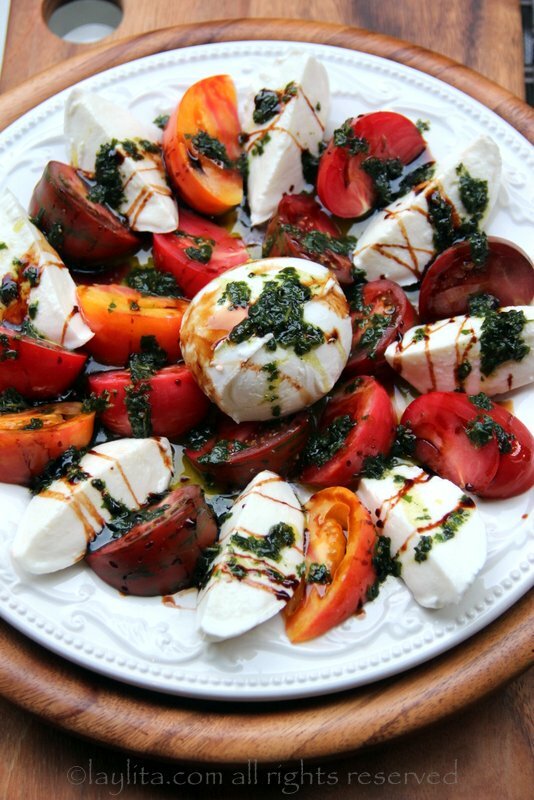 I don’t mind the addition of other ingredients, but it kills me when a caprese is served without basil or balsamic vinegar. 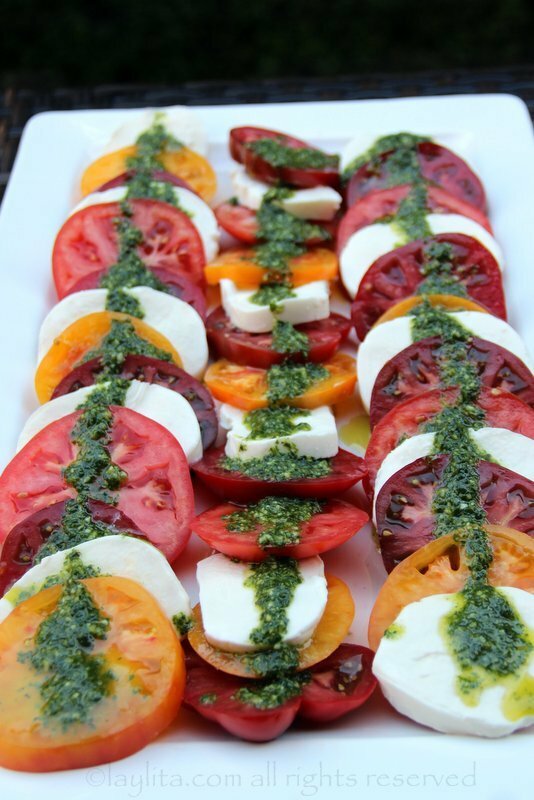 I do sometimes add fresh basil leaves, whole or chopped, when I prepare this caprese salad; however lately I prefer to make a basil oil sauce that I drizzle over the tomatoes and mozzarella. The basil oil sauce is similar to a more liquid pesto sauce (without the cheese or pine nuts), and is made by blending olive oil, basil and garlic. Using the sauce, instead of the whole leaves, allows the flavor of basil to be more distributed on the entire salad – plus it’s so addictive. You can use regular balsamic vinegar, but if you have time I highly recommend making a balsamic reduction which will give you a much more flavorful and concentrated sauce. 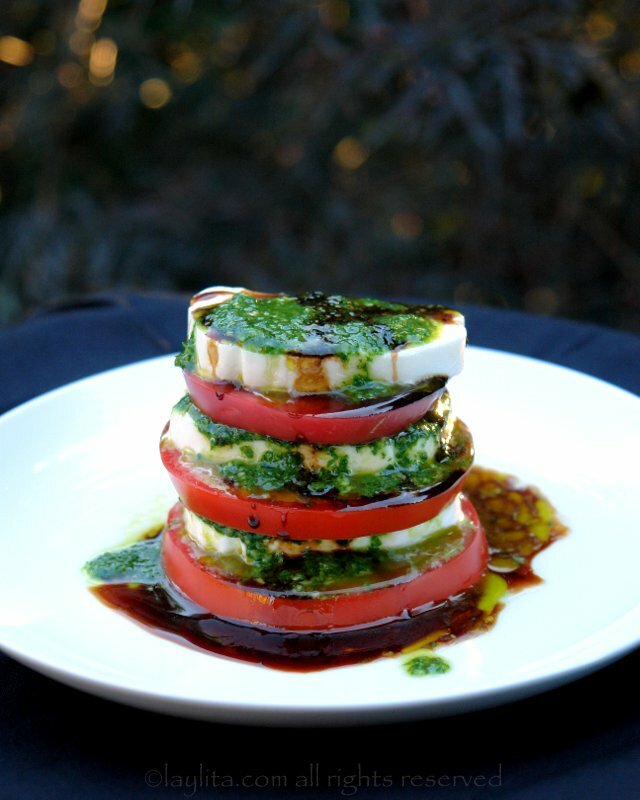 Easy recipe for homemade tomato and mozzarella caprese salad with balsamic vinegar reduction and basil garlic oil. 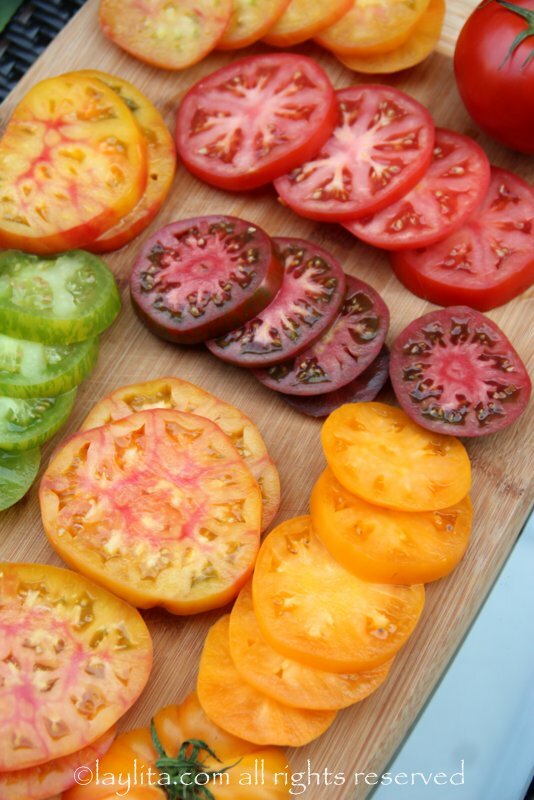 Slice, quarter or halve the tomatoes, based on your preferred salad presentation. 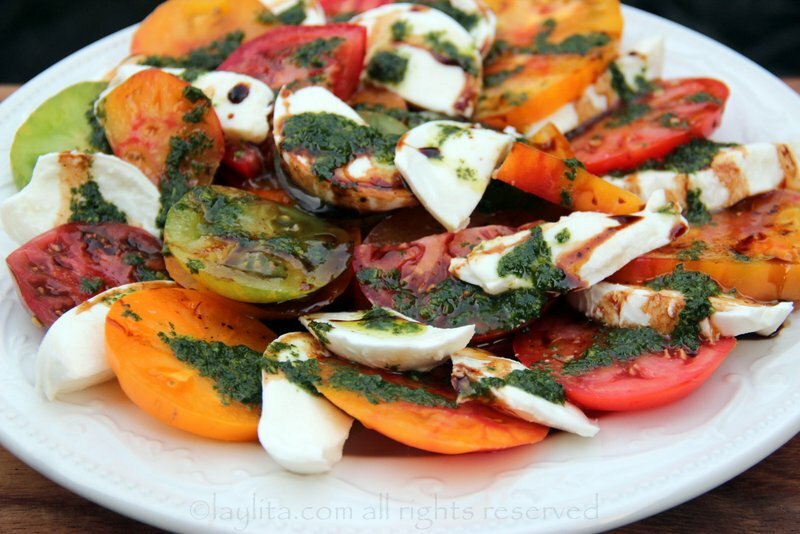 Slice, quarter or leave the mozzarella whole, again based on you would like to assemble the salad. 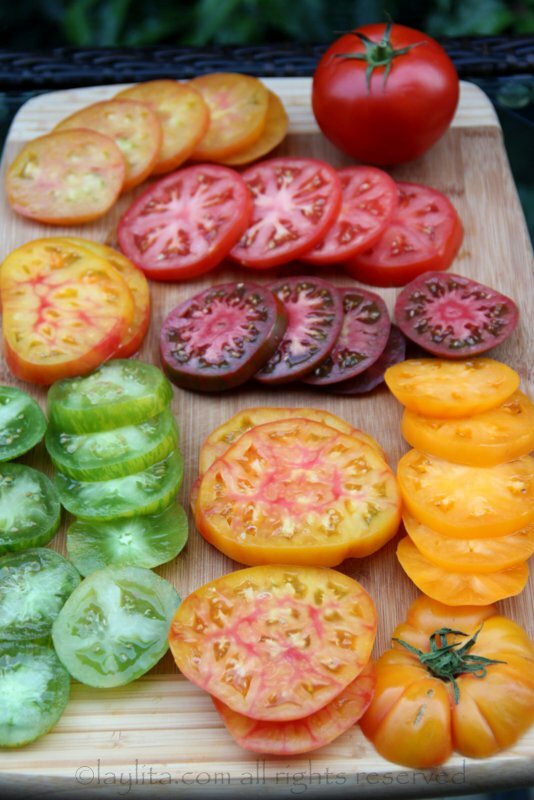 Arrange the salad on a large platter; you can use one or two platters depending on the size. 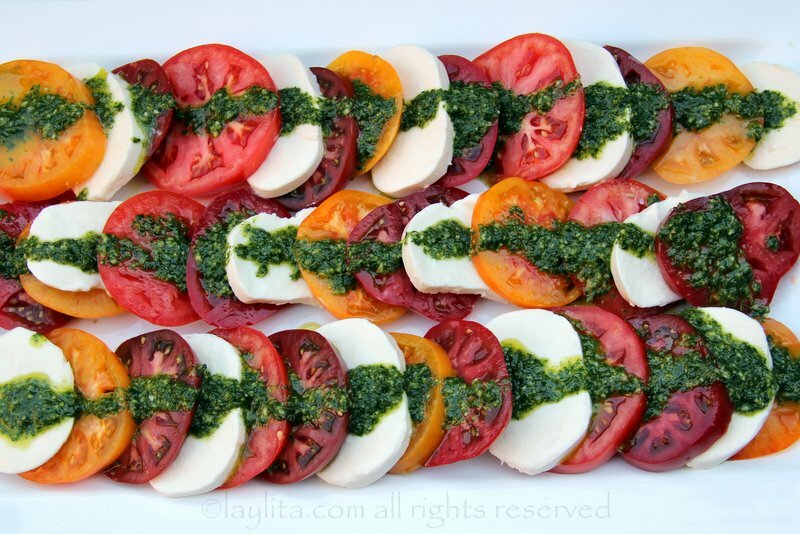 If using slices, you can add the tomato slices first and then either add the mozzarella slices on top, or stack them alternating the cheese and tomato slices in a slightly diagonal way. For a rectangular or square platter, you can create straight horizontal layers, and for a round platter you can form round spiral like layers. 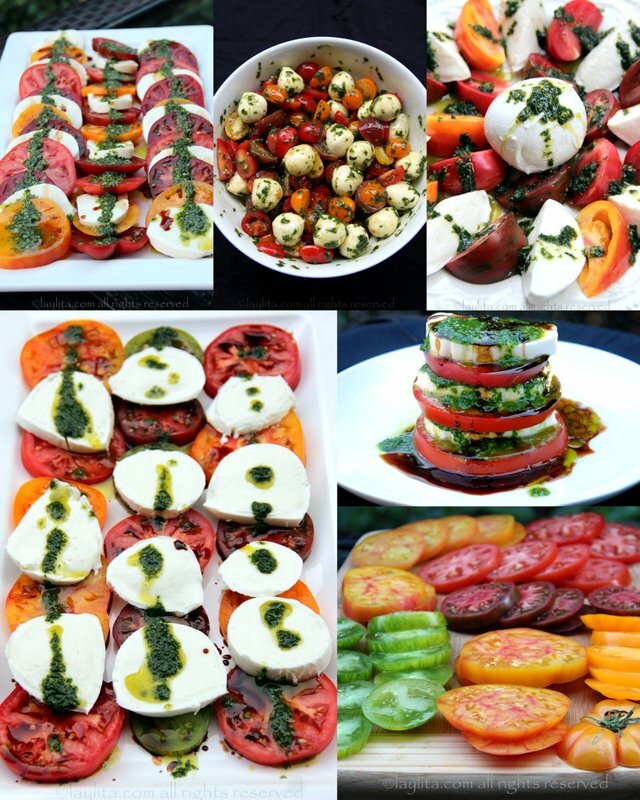 You can also place the mozzarella, whole or quartered, in the center of the platter, and arrange the tomatoes, sliced or quartered, around the cheese. 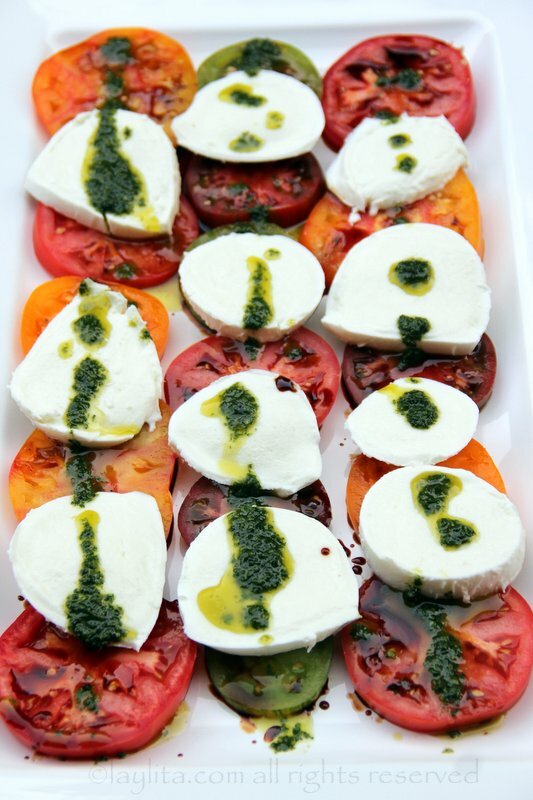 Place a tomato slice on a small or medium sized plate, add a sliced of fresh mozzarella, drizzle a small amount of the basil oil on top of the mozzarella. Repeat the same process until you have 2-3 layers of tomato and mozzarella. 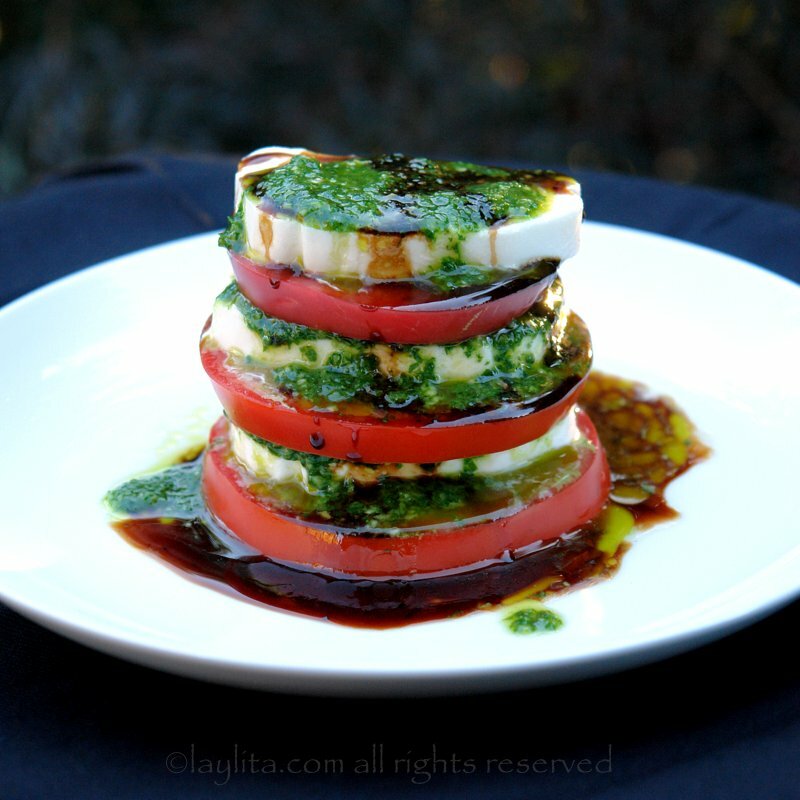 Drizzle the balsamic reduction on top of the caprese salad stacks. 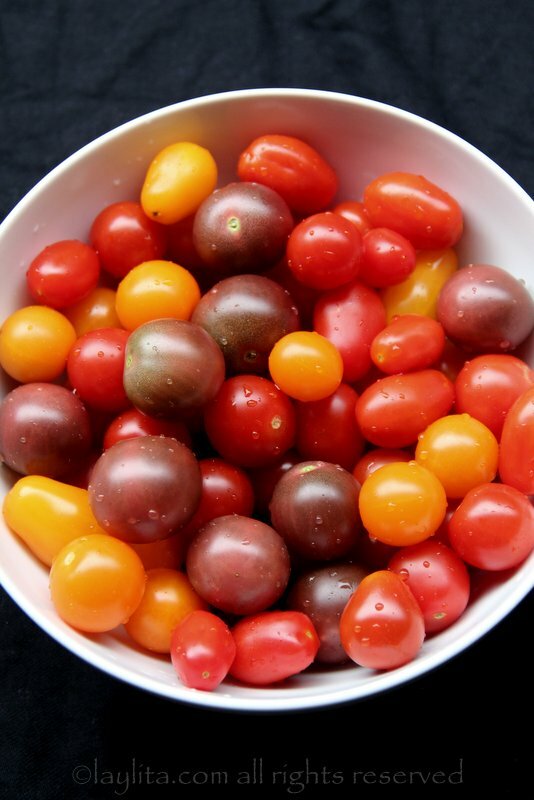 Use cherry or grape tomatoes, you can leave them whole or slice them in halves. 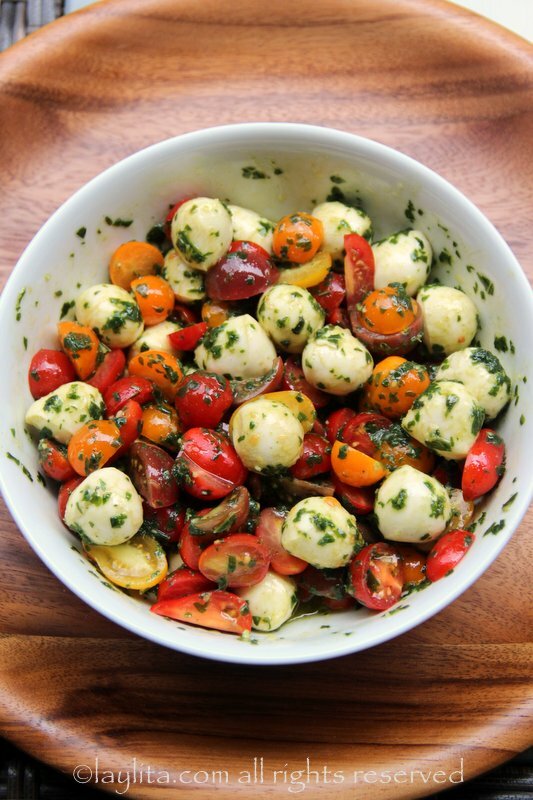 Place the mozzarella pearls or ciliegine in a bowl, add the basil oil and mix well. 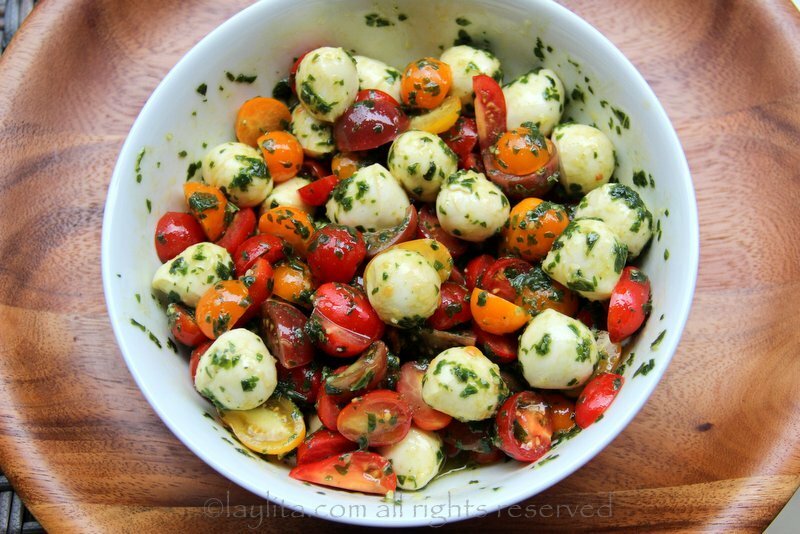 Mix in the cherry tomatoes. Drizzle with the balsamic reduction right before serving. 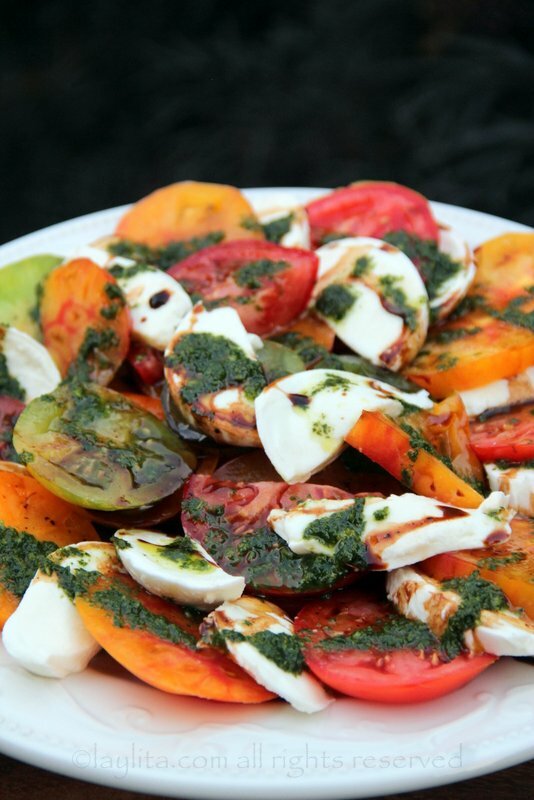 This tomato mozzarella salad is my oldest son’s favorite salad; it is guaranteed that if we go out to dinner and he sees caprese salad on the menu, he will choose it over anything else. While visiting family in Europe this summer, we found it everywhere on the menu in France, but surprisingly it was less common to see it on the menu in Italy – though of course most restaurants had the ingredients on hand, so if we asked they would make it. 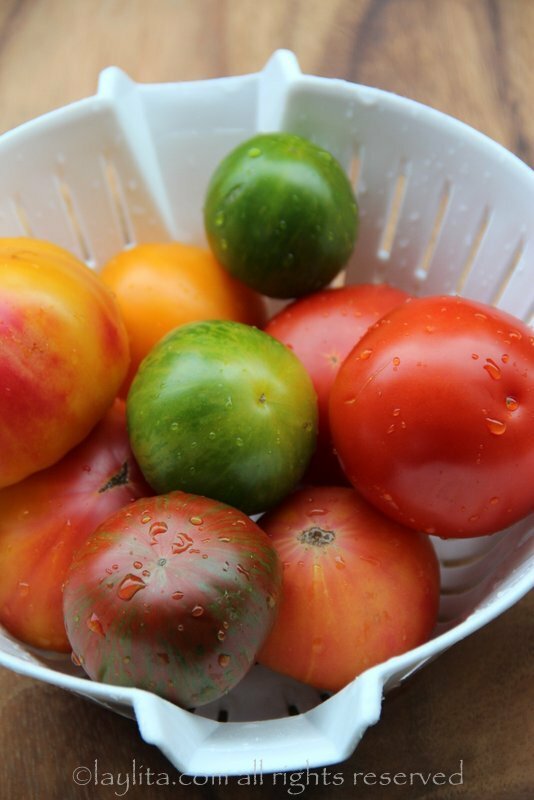 This salad can be customized based on the type of tomatoes you have available, it can made with regular vine tomatoes, it is delicious with a mix of heirloom tomatoes, and can also be made with cherry or grape tomatoes. There are different types of fresh mozzarella, made with cow milk or buffalo, and you can use your favorite to make this salad: the freshly made artisan style large balls in brine to the smaller fresh pearls or ciliegine to the deliciously creamy burrata mozzarella. The presentation of the tomato mozzarella caprese salad can also be customized based on your preference: you can slice the tomatoes and the cheese, you can cut them into quarters, for a caprese salad using burrata you can leave it whole on the center of the serving plate and arrange the tomatoes around it, for a salad using cherry tomatoes and mozzarella pearls you can leave them whole or slice them in half, you can create layered stacks, and more. 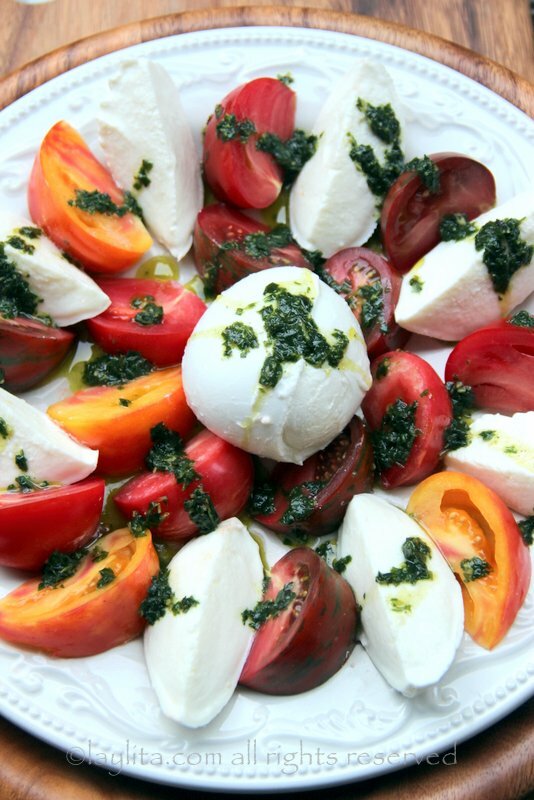 The ratio of tomatoes to mozzarella can be adjusted based on your preference (and budget), I usually use about 4-6 tomatoes (depending on the size) to one pound (16 oz) of fresh mozzarella. However, if I’m using a very expensive mozzarella, then I will probably use less cheese. In the US, Costco is one of my favorite places to buy fresh mozzarella, they have the 2-packs of sliced mozzarella and also the large container of mozzarella di buffala in brine, and both are great value for parties. One of the local grocery stores also has a very good mozzarella that they make in house; it’s more expensive than Costco, so I use it only for super special occasions. So I had a serious case of munchies and headed to my neighborhood market. Just needed bread, tomas, and the herb! Well I purchased mint on “accident purpose” and made it a sandwich. Oh my, what a wonderful twist on a classic!! The sweet from the mint and tomatoes married and had delicious babies? So good!!!! 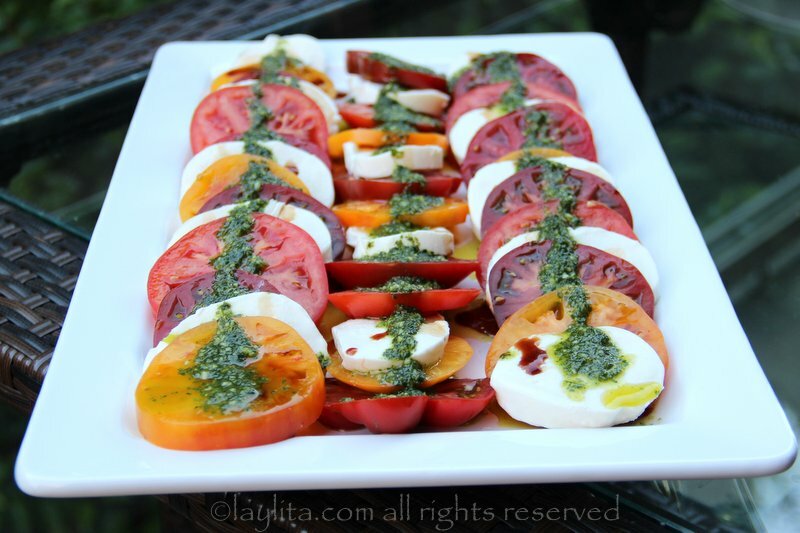 And that oil blend…dip dip dip!!!! !